I created these two layouts knowing that they would sit side by side in the bound album which presented a bit of a challenge. 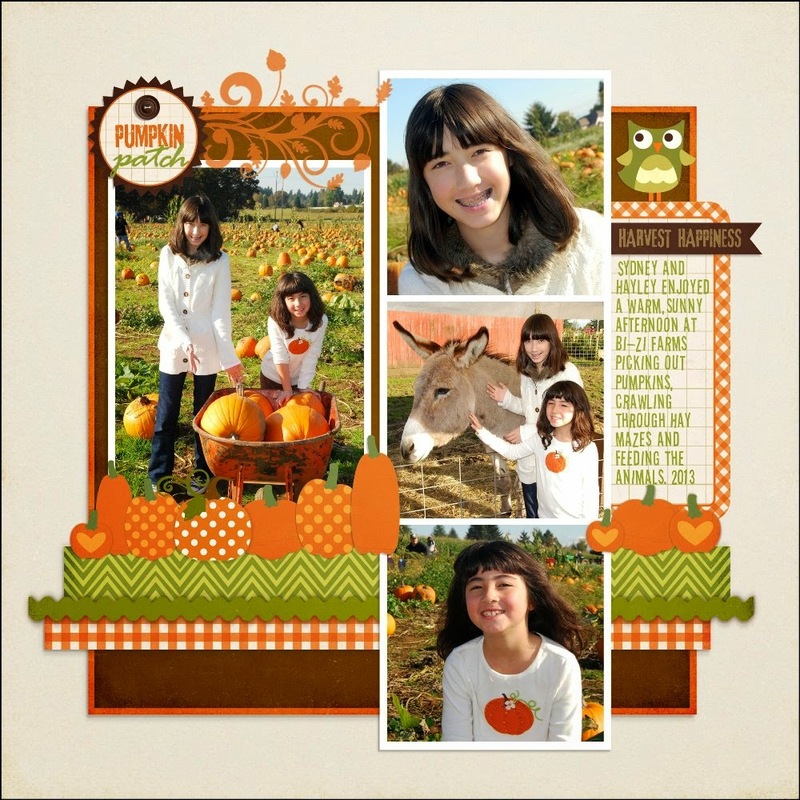 I wanted to scrapbook them in such a way that they stood as individual layouts that complimented their specific photos, but also didn't completely clash with each other. To achieve this I chose a unifying background color that would work for both layouts and used square mats of the same size. I also tried to pick more neutral tone-on-tone prints and similar tones of green & orange colors that would compliment both digital collections. To achieve this I had to play with the color tints a bit, but I've found that this ability is one of the little perks of working in digital. Haven't been here for awhile...and you've been busy, busy, busy. 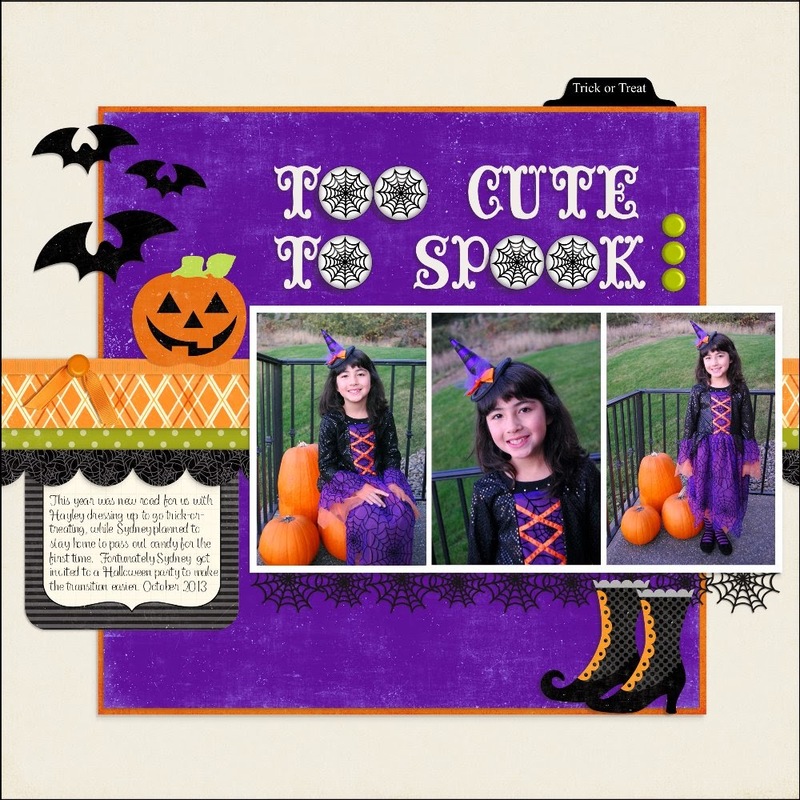 And these are such cute, sweet layouts...love how you make even Halloween sweet! You always do such a great job of making the layout colors match the photo colors---love it!! Gorgeous layouts Mendi! Your daughters are so photogenic and gorgeous! I cannot believe how much they resemble each other and you! I love the colors so much and I especially love the purple in the 2nd layout very much. Purple is my fav color and that purple is just so pretty! Hope the girls had a fabulous Halloween!